INDIANAPOLIS -- Indy's largest yoga event, Monumental Yoga, is happening Thursday on Monument Circle. The annual yoga class in downtown Indy is a donation-only event that supports Indy Yoga Movement, a non-profit teaching Indianapolis youth some very valuable lessons. "Indy Yoga Movement is all about the kids, it is all about them," says Suzy Bindley, the Co-Founder and President of Indy Yoga Movement. "Seeing their response and how they change and grow with the practice." 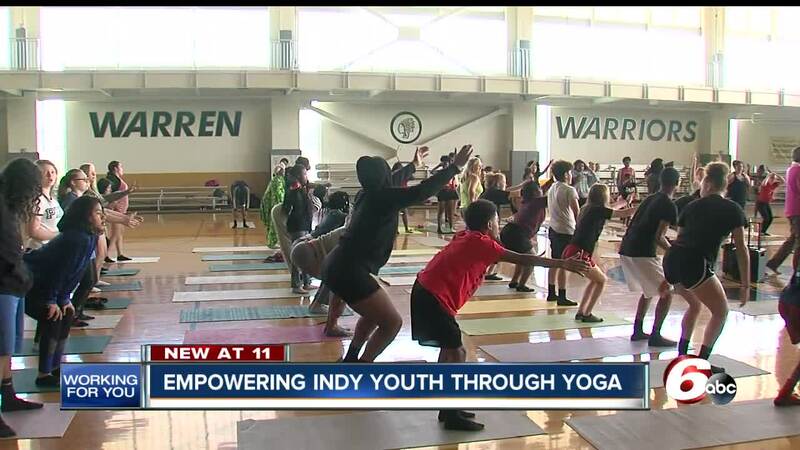 This Indy-based nonprofit works through schools to empower youth using yoga practices. The classes are a breath of fresh air for high school students. It is a yoga program created by Indy Yoga Movement specifically designed for Indianapolis students, kindergarten through twelfth grade. "These are life skills," explains Bindley. "I have seen them realize that they can calm themselves down. That whatever they are in at the moment, that they can find a way through it. And, that they can stick to something that is hard." The skills the students learn in their classes go far beyond the yoga mat. "This yoga class has helped me with a lot, it helps me focus and stay calm, even when I am mad and it motivates me," says Warren Central High School Freshman, Aryssa Price. Other students tell RTV6 these classes help them relax in between their studies and athletics. "It helps me focus more, it helps me prepare for anything that comes my way," explains Deshaw Boyd, a Sophomore at Warren Central. Since Indy Yoga Movement started in 2012, they have worked with more than 17,000 students in 34 different Indianapolis schools. The organization is at Warren Central High School once a week during the school year, and every day in the summer. "A lot of our kids, they have ADHD, have a hard time focusing, getting centered," states Candy Handy-Ogle, Physical Education & Health Department Chair at Warren Central. "This has been fabulous. Get it in! Get Indy Yoga Movement in your schools!" Indy Yoga Movement teaches 60-minute yoga classes with a certified yoga instructor. The program also takes the time to work specifically with at-risk students separately, and give them more hands-on sessions. "We go at a slower pace with these students, we ensure it is a safe space, a comfortable space, and we give them more advanced techniques on how to calm themselves down, and how to respond appropriately to situations," explains Bindley. The simple practices taught in yoga are used here to encourage youth to make their Indy community a better place for their future. "It has taught me to be at peace with yourself," says Warren Central senior, Maleek Mial. "It is just something to get your mind off the pain really, and just focus on life really, and it helps you think." These tools are embedded with the students to take forward with them outside of school. "It clears your mind so you can tell which students that try when they come out of it," states Warren Central Senior, Ron Gill. "I feel like this is good for the world." Everything donated from Monumental Yoga will go towards Indy Yoga Movement as they are consistently raising funds to maintain all of the existing programs they have now, and further implement this program into more schools that are on their waitlist. Monumental Yoga starts at 4 p.m. Thursday, June 21, on Monument Circle.